This old range light is in a somewhat odd situation, being located in the access lane at the rear of Blyth Terrace. It was originally much closer to the shore, but land reclamation carried out in connection with the construction of the South Harbour, means that it is now some 100 yards inland. Access (on foot) is simple from either the Bath Lane or East Park View end of the lane but photography can be hampered by the number of parked cars and a plethora of overhead wires. The tower is over 200 years old but the original tower was heightened in two stages with new levels being added in 1888 and 1900. As its name implies, it was originally the rear light of a range pair, the front light having now disappeared. 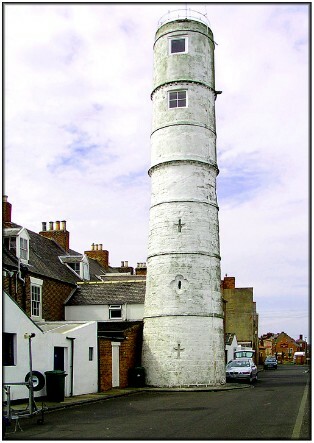 Although it looks as though it might have done, the tower never had a lantern, the light being displayed through the small square window visible near the top of the tower.